The sold-out event only made the evening even more anticipated, as Toronto-based but touring Alvvays came to Leeds for one night only. The atmosphere of the venue was pleasant and laidback, as the crowd showed a great range of excited fans – from sixth formers with school the next day to older music heads with their post-work pints in hand. Considering the successive unsuccessful changes to the function of Church as an entertainment venue over the years, it seems that it’s found its place as rather good gig venue, with not too bad acoustics as well. Arriving while support act, Spinning Coin, were playing, the crowd had yet to warm up as many were dazed from a long, and very chilly, Wednesday. Spinning Coin’s sound was a mix between eighties thrasher rock and dreary shoegaze, but the seemingly nonchalant vocals hid an experienced band who knew the mechanics of their songs extremely well, becoming clear towards the last three songs of their set. A greater stage presence could have brought out more from the well-engineered solos and instrumental bridges that were well executed during their short set. 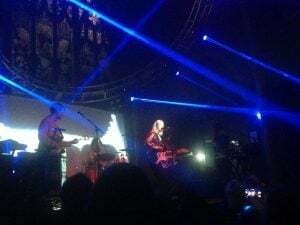 Alvvays then glided onto the stage, playing two songs before speaking to the audience, shouting out ‘School is cancelled’ to get things going, and mentioning Brudenell Social Club as the first venue they played in Leeds – hinting that playing in the much bigger Church showed the band’s growing popularity and the success of their 2017 album, Antisocialites. The main vocals could have been louder, but overall the band gave a performance that was close to their records – highly satisfying for the avid fans to sing along to. Dreams Tonite proved to be the most memorable and haunting of all the songs played, as the soft, sweet vocals evoked a nostalgia for something unknown and lost, but left a content audience, as the indie pop elements made the room move and set many heads nodding. The peak their set had to be Archie, Marry Me as the fan-favourite caused a mini mosh pit and an almost electric energy in the fitting church setting. Ending on an encore of two songs, Alvvays gave their Leeds fans a much-needed, feel-good mid-week boost with their short, sweet and upbeat act.